I’ve tried to stay out of this constant rumor mill and circus that is the INDYCAR Series since the Season Finale in Fontana. Not because I dislike INDYCAR, but because they can’t keep the bullets out of their feet. Every time something positive happens the series finds a way to screw it up. The 2012 Season was one of the best on-track, but the worst off-track. Constant rumors and stories were flying following the Indianapolis 500 in May that a group of owners were trying to oust the Series CEO. The owners at the time, weren’t very good at completing this task, but set in motion the events that led up to today. 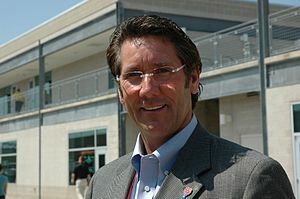 As of press time, INDYCAR Series CEO Randy Bernard announced he is stepping down and the IMS Board seemed to have wanted him gone as well. This comes with little surprise to me since all weekend there has been stories flying around that the CEO was out, and no person in their right mind would sit around and take this sort of circus. They announced the INDYCAR Series would replace Bernard after a short search. This is the first time since 1994 that the Series was going in the right direction. 1995-96 were plagued by the announcement of the IRL by Tony George. The same man that created the biggest single split in any professional league is the same man who appears to be responsible for Randy being out. Since 1996 the Series has been split, destroyed, and at times on the verge of bankruptcy…that is, until Randy was put in charge 3 years ago. The early favorites to replace Bernard are Tony George and Zak Brown (whom Tony George has said was interested, even though Brown said he was not). In Randy’s first season he was put in charge of a dying series, one with a TV Contract with a channel that only a small market of people could see. Not that the channel was a bad channel by any means, to be honest it offers the best coverage of any of INDYCAR’s TV contracts. Randy has made the best of this contract and has made NBC Sports a solid partner, and took advantage of what he was given. The Series shined on Versus/NBC Sports, and would have been available on NBC had ABC not blocked it. 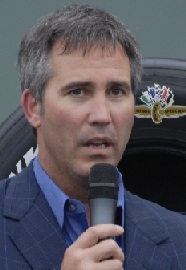 Randy was given an old junker of a chassis for the Series, and in the short time he was there he was able to put together the INDYCAR Series ICONIC committee and brought the Series a new Chassis. That chassis, later to be named the DW12 by Dallara, has produced one of the most exciting Indy 500’s in recent years as well as interesting and entertaining races all season long. The last American INDYCAR Series Champion came in 2006, but in 2012 Ryan Hunter Reay came home with the title. The season, while only competitive between really 3 teams, was never a given at any point. The Series Championship was right down to the wire, and didn’t need fabricated drama. At the end of the 2011 Season Randy Bernard was faced a tragic incident, that not even the best could have seen coming. Sure, the track was busy with 34 cars and speeds and down-force were high. The tragic accident on lap 13 was just that, tragic, and accidental. Dan Wheldon could have easily walked away from the wreck, but the most unfortunate series of events occurred leading to Wheldon’s death. None of this was anyone’s fault as it’s part of the sport, however Randy Bernard took a lot of heat and blame for it. Even the Hulman-George family and Indianapolis Motor Speedway Board (which oversees the Series) never stood up for Randy. Although Randy was able to move on as CEO, he never truly forgave himself for the incident. Things might have been different, but he was unable to do so without the proper support. However, in terms of his quality as CEO he was able pull most of the paddock and drivers around him. He replaced the plague that was Brian Barnhart, he brought in new chassis, and had China not bailed on the series it would have been the first year that the INDYCAR Series broke even. While Bernard not only brought the INDYCAR Series behind him, he seemed to be a fan favorite. From my personal experience with Randy, he was always open to the fans. You could email, mail, or even call his office and he always tried to return your messages or call. He was constantly meeting with new sponsors and tracks to increase the league awareness, and he loved creating new partnerships. Not only did he bring new tracks, and some old ones back, he brought Series sponsor IZOD on board. IZOD is the biggest partner that the INDYCAR Series has had since it had DirectTv (which rumors have it, even they didn’t keep their end of the deal). Randy was a fans CEO, and was as big of a fan as anyone I’ve ever seen. In the time with the Series, I saw Randy in the Turn 2 section of Indy (where I sit) each year. He sat in my row, spoke to every person around him, and even stopped to take pictures or sign autographs. Then this past season he came and sat 5 rows below me, where he remained for almost 10 laps before moving on somewhere else. Each year he was friendly and talked to everyone who stopped him or tried to speak to him. At an Indy 500 Practice Session last year I saw him walking near Gasoline Alley, where I stopped and asked him about the new car. He said he loved it as he walked on talking with other members of the series. I wasn’t a reporter or anything, just simply asked him in passing. That’s the kind of guy Randy Bernard is, and it’s a sad day to see him leave the series. want the responsibility of this circus. Whoever it is, it’s going to have to be a man of steel, because the Hulman-George Family is the biggest joke in auto-racing. The Series has no positive momentum now, and I hope that IZOD and other companies realize that before it’s too late. I hope the Hulman-George family sales the INDYCAR Series to someone else, just hope that it isn’t Tony George, because if it is you’ll see all ovals again and packracing (that most blame for Wheldon’s death). Colby Martin is an amateur sports blogger who enjoys INDYCAR, F1, NFL, NBA, and the MLB. His views and opinions do not represent anyone or anything other than himself. The Indiana Pacers come away with at big win against the Atlanta Hawks 102-98. Paul George led scoring for the Pacers with 20, and was the highlight of the game with a major alley-oop from Center Roy Hibbert late in the 2nd Quarter. The big dunk adds even more to George’s portfolio to get back into the All-Star Slam Dunk Contest. and shows the growing chemistry between Indiana’s big man and up and coming star scorer. Atlanta saw major contributions from the bench with Louis Williams leading them in points with 18. The Hawks saw themselves play a winnable game, and outplayed the Pacers in Rebounds and Turnovers. However the Hawks overall shooting percentage (76%) was enough to help the Pacers (89% FG%) come away with the win. Roy Hibbert and D.J. Augustin lead the Indiana Pacers in minutes in tonight’s win The Pacers return to action Friday in Orlando, and are home again on Saturday against the Memphis Grizzlies. The Hawks are at home on 10/18 against the Hornets, and the Mavericks on Saturday. Over the past few years the Pacers organization has shown promise in building a contending team. They’ve added players through the draft and free agency that have been significant to finishing 3rd in the Eastern Conference in 2011-12, and 2nd to the Chicago Bulls in the Central Division. Even though the lockout shortened the season, the Pacers finished 8 games out of 1st place, and 4 games behind the eventual NBA Champions Miami Heat. *Friday Night’s performance against Minnesota for Ben Hansbrough was significant enough for me to consider him a part of the roster. However, he may still be cut due to the depth at Guard for the Pacers. Look for Ben Hansbrough to be in the NBA this season. With the breakout season that Paul George had last season and Roy Hibbert becoming the best Center in the east (since Dwight Howard went to LA), I look for the Pacers to be one of the definitive teams to beat this year. The Pacers should easily win 50 games this year with the Eastern Conference in a major shakeup. The longtime Conference leaders of Orlando, Atlanta, and Boston major shakeups in the roster while the Pacers, Heat, and Chicago stay dominate. The 76er’s are a team with a lot of hope this season with the addition of star Center Andrew Bynum. I’m also predicting the Pacers to have 2-3 All-Star members. Those players will likely be Roy Hibbert, Paul George, and Danny Granger. I potentially see Ian Mahinmi making it to the Rising Stars game as well. The Pacers could also challenge for some of the flashiest dunks this season with Paul George and Gerald Greene on the roster. Could Increases in Safety Measures Make Us Risk Takers? If you were to stand in the pit lane at Las Vegas Motorspeedway on October 16th, 2011 and ask Dan Wheldon if he felt safe in a car he would tell you yes. However, I’m sure he would also be aware that his life could be at risk, but it wasn’t a fear. That lack of fear allowed Dan to be one of the fastest IndyCar drivers on an oval, winning the Indianapolis 500 twice. It’s also the lack of fear and the increase in feeling safe that causes millions of Americans to drive without a seatbelt, speed, text and drive, and even take risks that they normally wouldn’t. These risks, and the increase in safety measure in everything have led us to this lack of concern. Remember when the Jeep was a super popular car? I do, my mom even owned one for a short time. Do you remember the big issue at the time? Rollover. Jeep’s were very prone to rolling over due to their higher center of gravity. They were top-heavy, and if you went a little to fast around a corner you were bound to tip the thing. How did we overcome this? We drove slower around corners, we were more cautious to our surroundings and tried to not put ourselves in a position to flip. But the car manufacturers and government wasn’t ok with just that, they began lowering the weight so that there was a better balance allowing drivers to take corners at faster speeds in an SUV. Has it led to a mass amount of rollovers? No, but it has created a generation of drivers who don’t worry about the rollover issue as much as we did a decade and a half ago. They’ve become so safe, in a 2011 CNN article, they said a person driving a 2009 model car was twice as likely to die in an even of a rollover than a person driving a 2009 SUV. Does this mean we drive more cautious than we used to, or does this mean people in cars drive harder? I’m not sure, but becoming more safe will likely cause us to driver harder than before. Sporting leagues, teams, and youth organizations around the world are always looking for ways to make a sport safer. Little League Baseball banned most of the larger negative weighted bats. They increased the size of the protection in the helmets, and began requiring all coaches to wear them on field (even though most still don’t). The NFL has increased padding, began using revolutionary helmets with military technology in them, and have been forced to make rules to protect players. That last part, that’s due to the safety. Players aren’t afraid of getting hurt so they’ll tackle head first, they’ll dive straight into someone with their heads. Bob Costas was on HBO last week talking about how playing football would be safer if they took the helmets away. While the number of deaths are low in these sports, the long-term health risks can be extreme. Serious injuries can occur during acceptable play. However, increased rules have led players to playing with less risk and concern for one another. Physical play has become more common in sports like soccer and basketball, sports once known for their finesse. Ask any race car driver, they’ll tell you that there are serious risk involved and that each of them could potentially be killed on the track. That never made them stop racing though. With the improvements in safety it made a lot of them drive even harder. Look at the INDYCAR Series. There had not been a death during a race since 1999. Sure there have been deaths in practice or in testing (Paul Dana and Tony Renna) recently. This gave many of the drivers a feeling that even if they did wreck they would be a little beat up, but they would survive. Many of them drove fast, risky, and often made moves that they shouldn’t have. Just Youtube an old IRL race from the early-2000’s. You’ll see flat-out racing with drivers interchanging lanes, blocking, running 3-4 wide all while being a few feet, or inches, away from one another. It was exciting TV and a great product to watch, but the risk it ran was extreme and scary, but the safety was advancing so fast that the drivers got crazier. They wanted to win, it was all about getting the big money. Introductions of the HANS device, the SAFER barrier, and increased front and side collision safety allowed drivers to push the limit even further. As the years went by with fewer deaths and accidents, we began to see drivers with less respect for one another. Winning became even more import due to the lack of sponsorship dollars. Teams were straining to find funding and began dropping like flies. If you wanted to remain in the series, you had to find a way to be faster and better than everyone else, even if that meant pushing the limit too far. Over the years the series began to realize it was getting more risky and the dangers were rising. Their response was to have Honda and other engine companies de-stress the engine and allow it to hit max speed at lower RPM’s. They also lowered the amount of horsepower an engine could have. Thus the speeds were lower and doing so was to increase safety and lower the risk. All this did was create bigger packs where cars couldn’t pass each other and ran closer. Even though the races of the early to mid 2000’s were dangerous and close, the packs were often spread out and ran in 5-6 car packs. We saw in 2010 and 2011 what size packs we could run in, and they sometimes would be 8-10 car packs. This all culminated in the season finale at Las Vegas in 2011 when Indy 500 Champion Dan Wheldon was killed in a multi-car accident on lap 13. The race was one of the most dicey I had seen in years, and was the first time I was enjoying an oval race again. But it wasn’t safe, the cars were 2-3 feet apart in speeds in excess of 210 mph. Drivers were switching lines like it was no big deal, and cars were all flat-out. All of this took place because these were the measures in which the INDYCAR Series deemed to be the safest. Today everything is safer, they tell us what is healthy for us and what is not. Cars are equipped with state of the art safety features including side-airbags and seats that support head and neck. They have crash ratings that allow the vehicle to absorb the energy of the crash rather than your body. Those safety features have led us to fewer traffic accidents resulting in death. However, people driver harder than they did before. From my experience on the road people are more risky, they have a tendency to cut you off, speed, and often do so in a dangerous manner. In the past year I have avoided countless accidents through pure luck. Between people on their cell phone switching lanes, or people running red lights and stop signs, I have had several close calls. I’ve been driving for a decade now, I feel less safe driving today than I did in the past. Not because of the vehicles, but because of the increase in safety. I feel like I could drive 100 and cut corners if I wanted to because my car has a racing suspension. It’s a Mazda, it feels extremely safe in and I could get away with a lot of dumb things and be ok.
That’s the philosophy a lot of people have. I read an interview at the end of the book SuperFreakonomics. The writers of the book host a podcast in which they had Glenn Beck on. Now I’m not a huge fan of Glenn Beck because I think he mostly blows smoke. However, in this transcript they spoke about him buying a new car. Beck said the car salesperson was telling him how safe the car was and that if he pressed a button he could take corners like a racecar driver and it had a feature that helped prevent rollovers. I don’t remember the entirety of the interview and everything he said, but the just of it was that the increase of safety gave him and a lot of other people this feeling of invincibility. For a lot of us safety is the number one concern for us. We have families, or we are planning to, and we want them to be safe in a vehicle. We want our children to be safe in sports, or behind the wheel when they begin to drive. We want to keep guns and weapons out of buildings for our safety. We want everything to be safe so we don’t have to worry, but does not worrying mean we put our guard down and stop having concern for everyone else? Sure safety is an amazing thing and is very important, but sometimes the safest idea isn’t really the safest. Maybe the NFL should reduce the helmet safety measures a bit. A few instances of injuries that are severe will teach players to back off so that we don’t hurt ourselves. Racing series need to increase speeds while maintaining the overall car safety. If cars go faster and drivers have to drive the cars, they won’t be so close to each other. The INDYCAR Series did a fantastic job with that this year. They stopped using dependable tires and made the downforce less of a factor. This forced drivers to drive the car, they couldn’t control it if they stayed flat-out and raced like maniacs. After the death of Wheldon, this was the only way the series could race ovals. The drivers were scared, cautious, and smart about how they raced. The same thing goes for everyday cars. Stop telling us how safe they are before we start driving like a bunch of racers. Make the cars safe, but don’t throw it in our face. The increase of safety often gives people the thought of invincibility. There’s no fix to any of these issues, but if we can take anything away from this is that the increase of safety has allowed us to live more dangerously. We feel safe, we feel like we don’t need to worry that we’re protected. We’ve put our guard down. Some say that we have begun to de-evolve as a species. That’s a whole new discussion, but maybe this has something to do with it. We evolve (if you believe in evolution, I myself do) to survive and become stronger than our fellow humans. If we take that process of figuring out on our own how to survive and keep us safe, we’ll never try to overcome issues, we’ll just be glad we’re safe.